'Could the Force Really be With Us?' in Institute of Art and Ideas. 'Did the dying Stephen Hawking really mean to strengthen the case for God?' Guardian. 'Panpsychism' (2017) in Schneider, S. & Velmans, M. (Eds.) Blackwell Companion to Consciousness, 2nd Edition, Blackwell. 'Bertrand Russell and the problem of consciousness' (2016) in S. Leach & J. Tartaglia (Eds.) Consciousness and the Great Philosophers, Routledge. I recently did a radical update of the 'Panpsychism' entry of the Stanford Encyclopedia of Philosophy. My book was published by Oxford University Press in 2017. Quick summary: I argue against the dominant solution to the mind-body problem – physicalism – and explore and defend a radical new alternative: Russellian monism. 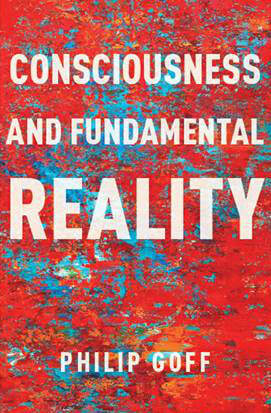 "This book contains some of the most important contributions to the metaphysics of consciousness in recent years. Philip Goff develops a sophisticated argument against materialism, and then explores the prospects for radical alternatives in considerable depth. He makes a strong case for panpsychism, the thesis that consciousness exists at a fundamental level of physical reality, and extends this to a case for cosmopsychism, the thesis that the universe as a whole is conscious. Anyone interested in the philosophical problem of consciousness should pay close attention to his ideas." "Goff has produced a grand piece of speculative metaphysics, in the tradition of Leibniz, Spinoza and Unger. It is also probably the best single piece of work emerging from the recent bloom of interest in Russellian monist views of consciousness. Starting with plausible and well-defended premises, he argues for a daring conclusion that many will find difficult to accept; yet, he makes a compelling case that there is no easy way to resist it. Figuring out how to respond to his rigorous and thorough arguments will be highly instructive (and fun!) for anyone with an interest in metaphysically-oriented philosophy of mind." "This book will quickly become a reference point for philosophical discussions of consciousness. Philip Goff lays out the issues with precision and cuts through to the heart of the latest philosophical technicalities. He also writes beautifully and advances a number of strikingly novel theses. No philosopher interested in consciousness can afford to ignore Consciousness and Fundamental Reality." "In an era of increasing specialization and “small ball” philosophy, Philip Goff’s Consciousness and Fundamental Reality comes as a welcome antidote. He defends a grand metaphysical vision of the world, constitutive cosmopsychism, according to which the universe as a whole is conscious, and everything else is grounded in its evolving conscious state. Yes, this view is revisionary. But all views on the mind-body problem are revisionary – including orthodox physicalism. Goff develops a number of powerful arguments against the alternatives as well as a positive case for his cosmopsychism. His discussion demands – and will repay – our close attention." 'Essentialist modal rationalism,' forthcoming in Synthese. 'Grounding, analysis and Russellian monism,' forthcoming in S. Coleman (Ed.) The Knowledge Argument Then and Now, Cambridge University Press. 'Cosmopsychism, micropsychism and the grounding relation,' forthcoming in W. Seager (Ed.) The Routledge Handbook of Panpsychism. 'Russellian Monism' (co-written with Sam Coleman) forthcoming in U. Kriegal (Ed.) Oxford Handbook of the Philosophy of Consciousness​, Oxford University Press. 'Conscious thought and the cognitive fine-tuning problem,' Philosophical Quarterly 68: 270, 98–122. ‘Is it a problem that physics is mathematical?,’ in a special issue of Journal of Consciousness Studies on Susan Schneider’s ‘The problem of the physical base’ 24: 9-10, 50-58(9). 'Panpsychism' in Schneider, S. & Velmans, M. (Eds.) Blackwell Companion to Consciousness, 2nd Edition, Blackwell. 'Panpsychism' entry of the Stanford Encyclopedia of Philosophy ​(I wrote this pretty much from scratch, except for the history section). 'Is consciousness transcendent?' forthcoming in a special issue of Journal of Philosophy of Life on James Tartaglia's book Philosophy in a Meaningless Life. ​'Bertrand Russell and the problem of consciousness' in S. Leach & J. Tartaglia (Eds.) Consciousness and the Great Philosophers, Routledge. Is realism about consciousness compatible with a scientifically respectable world view?, Journal of Consciousness Studies 23: 11-12, as a part of a special issue on Keith Frankish's 'Illusionism as a theory of consciousness'. 'The phenomenal bonding solution to the combination problem,' in G. Bruntrop and L. Jaskolla (Eds.) Panpsychism, Oxford University Press. 'Against constitutive forms of Russellian monism,' in T. Alter & Y. Nagasawa (Eds.) Russellian Monism, Oxford University Press. ‘Real acquaintance and physicalism,’ in P. Coates & S. Coleman (Eds.) Phenomenal Qualities: Sense, Perception, and Consciousness, Coates, P. and Coleman, S. (Eds. ), Oxford University Press. 'What’s wrong with strong necessities?' co-written with David Papineau, Philosophical Studies, 167: 3, 749-62. ‘The Cartesian argument against physicalism,’ in J. Kallestrup & M. Sprevak (Es.) New Waves in the Philosophy of Mind, Palgrave Macmillan, 3-20. ‘Orthodox property dualism + linguistic theory of vagueness = panpsychism,’ Consciousness Inside and Out: Phenomenology, Neuroscience, and the Nature of Experience, Brown, R. (Ed. ), Springer, 75-91. ‘Reply to Simon and Robinson,’ Consciousness Inside and Out: Phenomenology, Neuroscience, and the Nature of Experience, Brown, R. (Ed. ), Springer 119-23. ‘Idealism,' Encyclopedia of the Mind, Hal Pashler (Ed. ), Sage Reference. 'Does Mary know I mean plus rather than quus? A new hard problem,' Philosophical Studies 160: 2, 223-35. 'A priori physicalism, lonely ghosts and Cartesian doubt,' Consciousness and Cognition​, 21: 2, 743-46. ‘Ghosts are still scarier than zombies’ Consciousness and Cognition, 21: 2, 749-50. 7. 'A posteriori physicalists get our phenomenal concepts wrong,' Australasian Journal of Philosophy, 89: 2, 191-209. ‘There is no combination problem,’ in M. Blaumauer (Ed.) The Mental as Fundamental, Ontos Publishing House. ‘Ghosts and sparse properties: Why the physicalist has more to fear from ghosts than zombies,' Philosophy and Phenomenological Research, 81: 1, 119-39. ‘Orthodox truthmaker theory cannot be defended by cost/benefit ​analysis,' Analysis​ 79: 1. 'Could the Daleks stop the pyramids being built?,' in Dr. Who and Philosophy, Lewis, C. and Smithka, P. (Eds.) Open Court Press. ‘Why pansychism doesn’t help explain consciousness,' Dialectica, 63: 3. ‘Can the panpsychist get round the combination problem?,' The Mind that Abides: Panpsychism in the New Millennium, Skrbina, D. (Ed. ), Benjamins Publishing. 'A non-eliminative form of austere nominalism,' European Journal of Philosophy, 16: 1. ‘Kirk on empirical physicalism’, Ratio, 20: 1. ‘Experiences don’t sum,' Journal of Consciousness Studies, 13: 6. Also published in Consciousness and its Place in Nature, Anthony Freeman, A. (Ed. ), Imprint Academic (2006) and Consciousness and the Mind-Body Problem: A Reader, Alter, T & Howell, R. J. (Eds.) Oxford University Press (2011). ‘Propertied objects as truth-makers,' Topics on General and Formal Ontology, Valore, P. (Ed. ), Polimetrica International Scientific Publishers. 1. Galileo's Error: A Manifesto for a New Science of Consciousness, will be published in August 2019 by Pantheon (US) and Rider (UK). This book is aimed at a general audience. 2. Consciousness and Fundamental Reality, Oxford University Press (2017). 3. Spinoza on Monism (Ed.) Palgrave Macmillan (2011). 4. Metaphysics: The Key Concepts (with Helen Beebee & Nikk Effingham), Routledge (2010). 1. Comparative review of Philip Kitcher 'Life after faith: A defence of secular humanism' and John Cottingham's 'Philosophy of religion: Towards a more human approach', Times Literary Supplement (April 17th 2015). 2. Review of 'The conceptual link from the physical to the mental,' Robert Kirk Notre Dame Philosophical Review (2013). 3. Review of 'Phenomenal consciousness,' by Dimitris Platchias, Australasian Journal of Philosophy 91: 3, 617-20 (2013). 4. Review of ‘Consciousness, Function, and Representation’, Ned Block, Mind 60: 240, 652-6 (2012). 5. Review (co-written with Hedda Hassel) of ‘Re-Emergence’ by Gerard Vision, Notre Dame Philosophical Reviews (2012). 6. Critical notice of ‘Emergence in Mind’ by Macdonald and Macdonald (eds.) (5000 words), Notra Dame Philosophical Reviews (2011). 7. Review of ‘Real Materialism’ by Galen Strawson, Philosophical Quarterly, 60: 240, 652-6 (2010). 8. ‘No hobbits?’ Review of ‘Truth and Ontology’ by Trenton Merricks, Times Literary Supplement (May 16th 2008). 9. ‘Why zombies are scary’ Review of ‘Zombies and Consciousness’ by Robert Kirk, Times Literary Supplement (November 24th 2006).